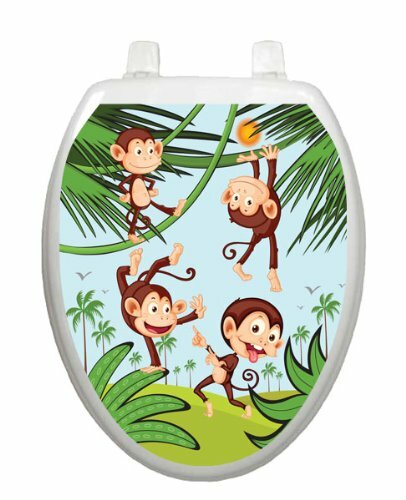 When it comes to decorating a bathroom to be used by children, a jungle bathroom decor theme is always a big hit. 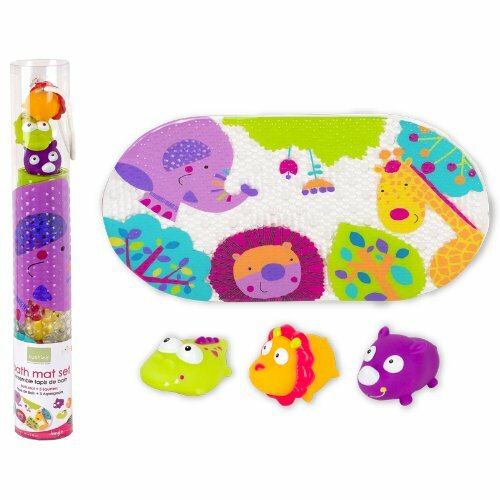 Kids will love the fun theme with the animals and bright colors and will enjoy spending time in this space. 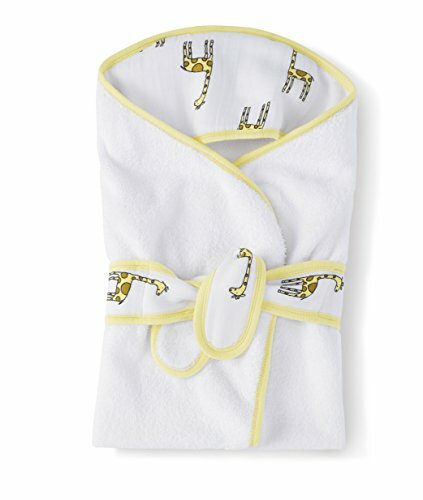 When decorating any room specifically for children, it is a good idea to keep in mind that children do grow up and will eventually outgrow the theme. 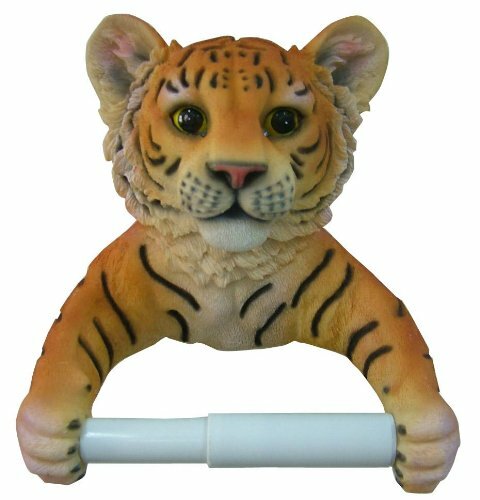 Therefore, it is wise to do your decorating bearing in mind that you will need to change things around within a few years. 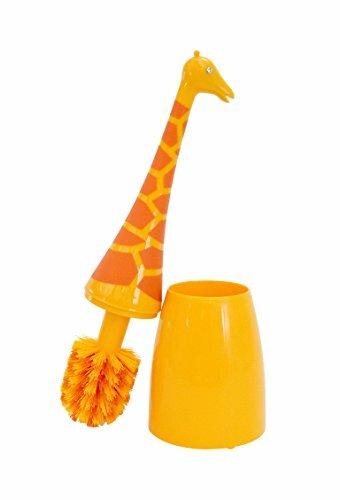 Here are some great ideas for jungle bathroom decorations. 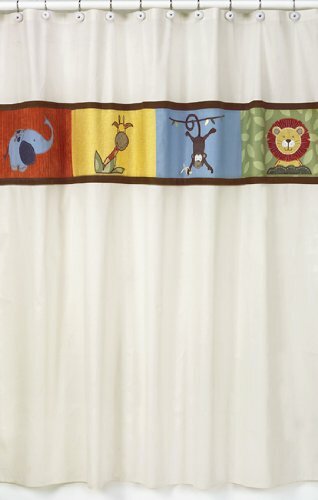 The shower curtain is always a great place to start when decorating a bathroom with a theme. 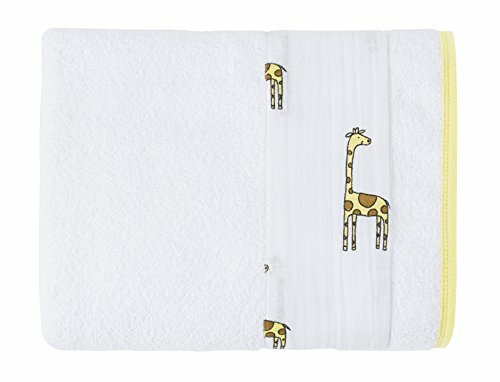 The shower curtain can be a great focal point in a bathroom, and works well to really bring the theme together. 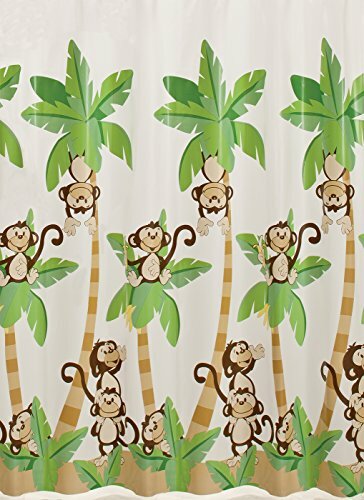 For the jungle bathroom idea, there are several brightly colored shower curtain ideas available from various retailers. 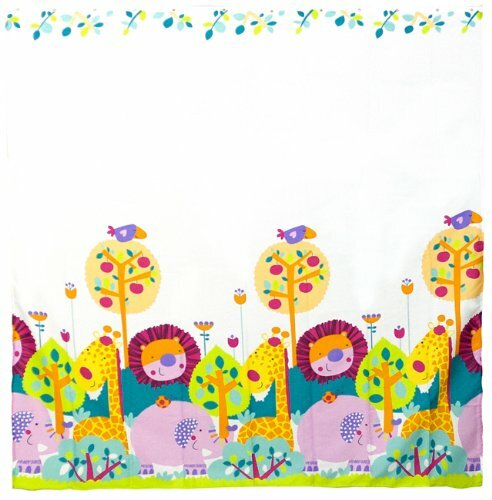 Amazon offers the Jungle Time Kids Bathroom Fabric Bath Shower Curtain by Sweet Jojo Designs which features fun, cartoonish jungle animals such as lions and monkeys and provides a bright, bold color scheme. 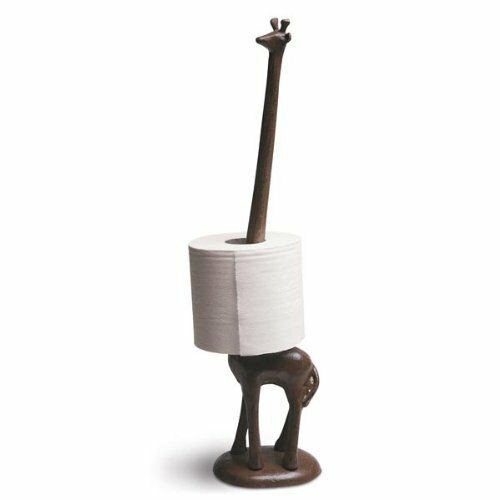 The walls of the bathroom are another great place to focus on when decorating. 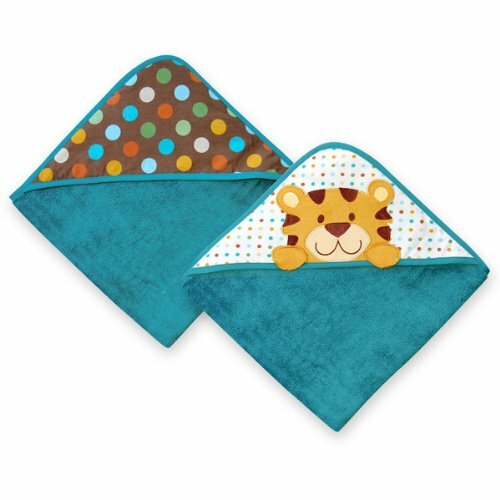 Decide if you want to paint in bold jungle colors, or perhaps paint a jungle mural on the walls. 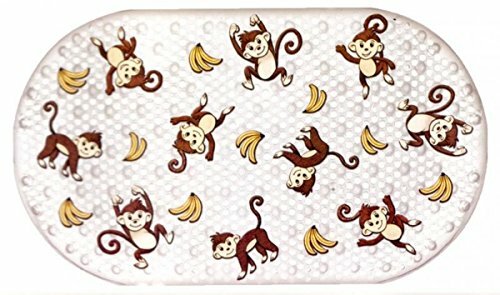 Just keep in mind that when the children get older, you may have to paint over your masterpiece, so weigh this decision carefully. 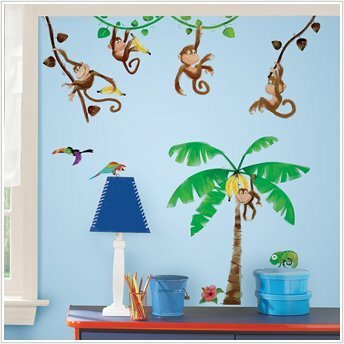 Another less permanent solution for wall decor is using peel and stick wall decals with jungle themes. 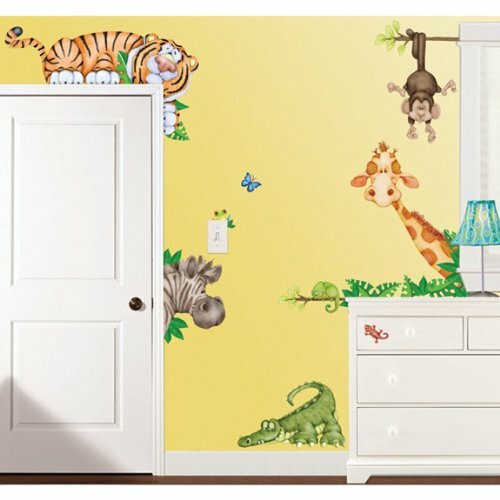 These wall decals will not damage the walls or the paint, and leave behind no sticky residue or adhesive. 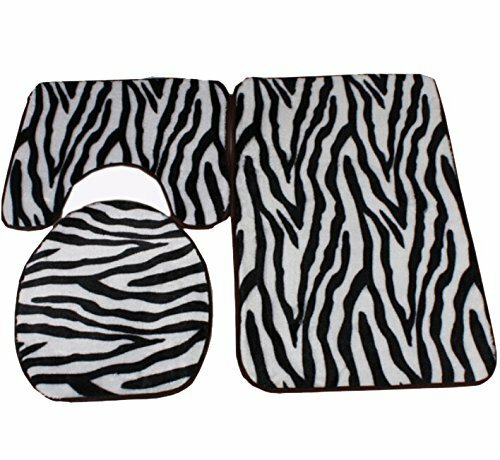 They are great because they can be repositioned and removed at any time you choose. 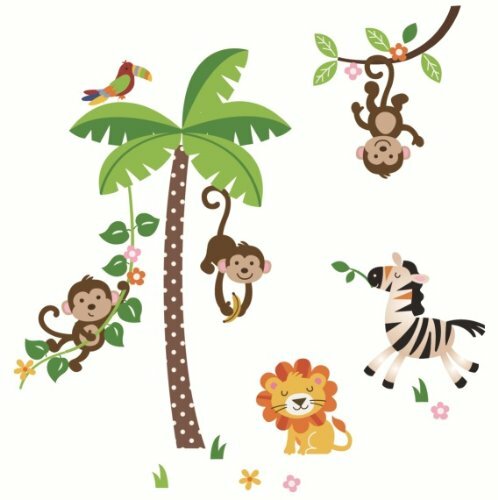 Some cute choices found on Amazon include the Jungle Monkeys and Tree Giant Baby/Nursery Wall Sticker Decals for Boys and Girls by CherryCreek Decals, In The Jungle Large Wall Decals/Stickers by Borders Unlimited, and Huge Set of 82 Monkey Business Wall Decals Palm Trees Jungle Theme by RoomMates. 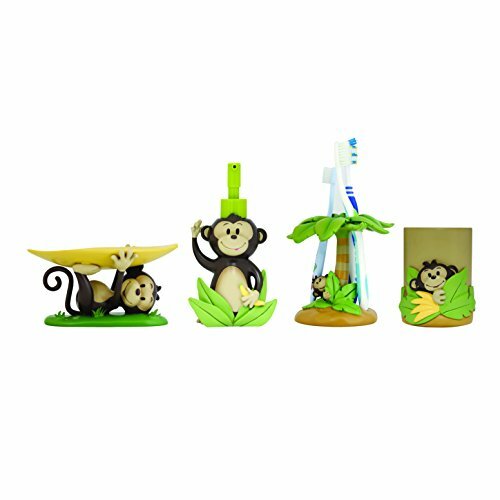 All of these sets feature cute, brightly colored animals and the ones that specify trees feature a nice palm tree decal for a real jungle look for the bathroom. 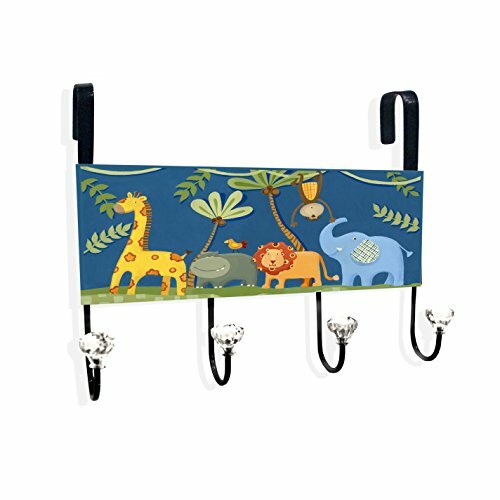 Accessorizing with jungle bathroom decorations is the perfect finishing touch. 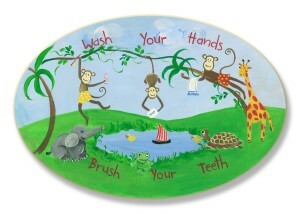 The Kids Room Wash Your Hands Brush Your Teeth Monkeys Oval Wall Plaque by Stupell Industries (top of page) is the perfect compliment to the jungle theme bathroom. 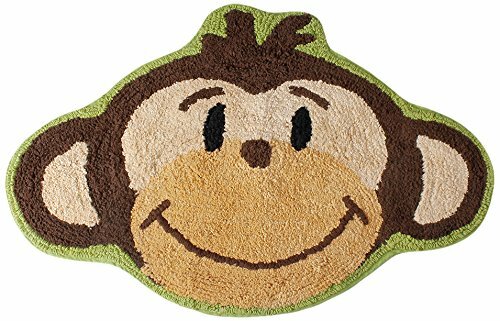 This oval plaque has a very cute jungle theme painted on it and the colors will compliment any of the shower curtains or wall decal sets listed above. 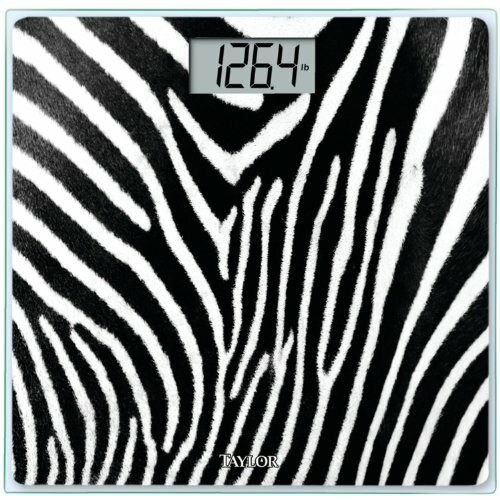 This plaque is also available through Amazon. 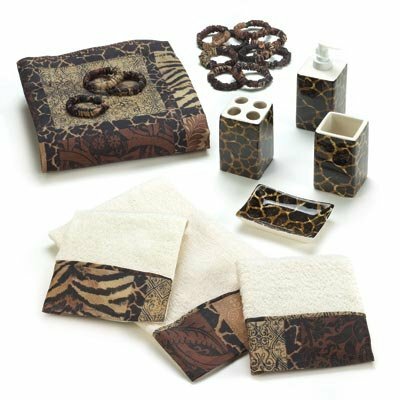 Many other retailers offer jungle theme bathroom decorations as well, this is just a sampling of the things that you might find when looking for decorating ideas. 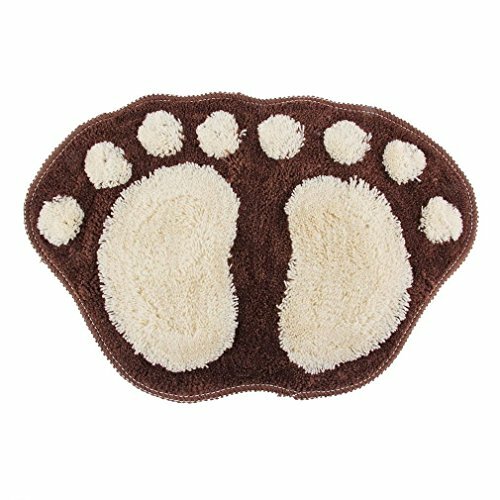 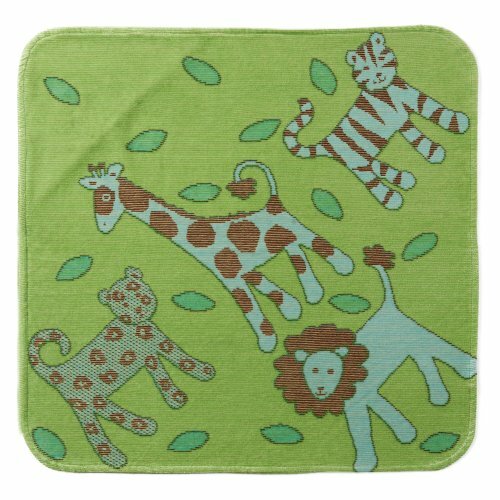 Other accessories for your jungle bathroom might include a jungle theme bathmat, small bath rug, and towels. 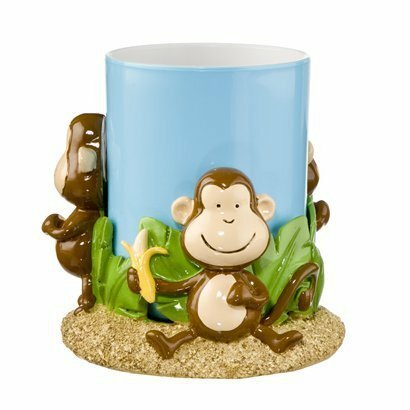 Shops around for those featuring jungle animals, and if you cannot find any with prints, stick with solid colors that are in your existing decor. 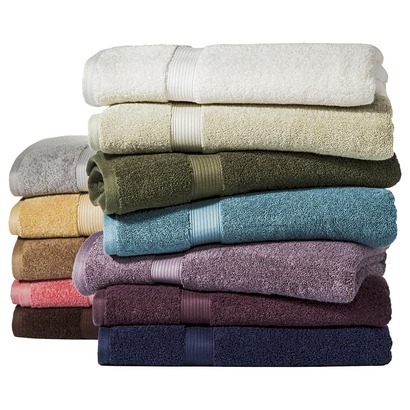 For example, a ” jungle green” rug, or “sky blue” bath towels will match your shower curtain and wall decor perfectly. 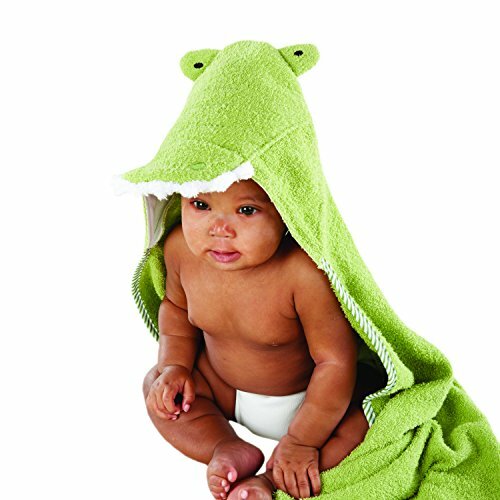 The perfect thing about all of these decorating options is that they are easily reversible when your child is old enough to no longer appreciate the jungle theme. 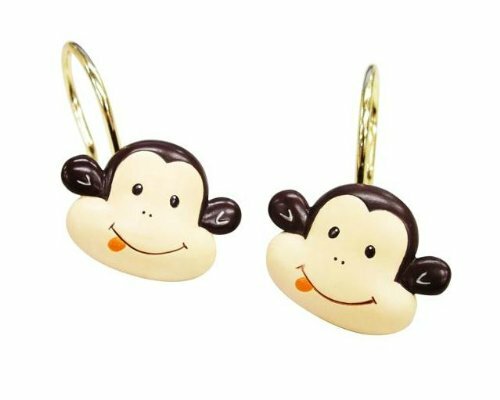 They can be removed simply and without damage, to make room for the new, more mature decor.